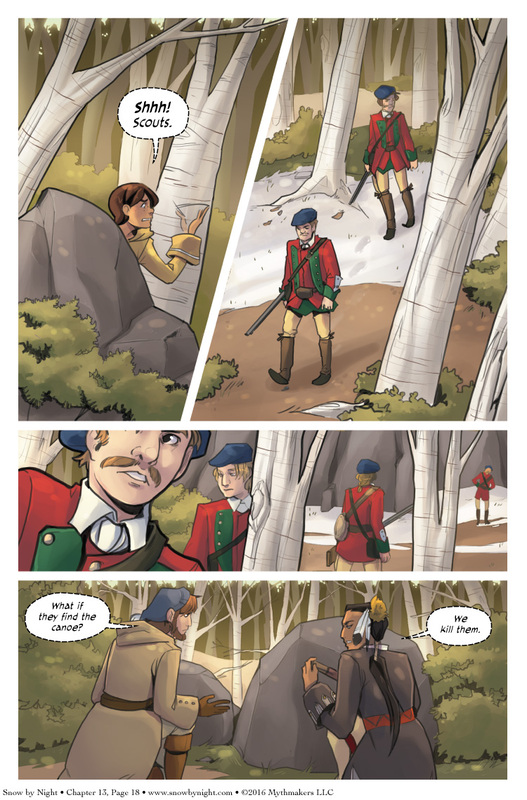 Morantine scouts prowl through the woods on Chapter 13, Page 18. When you have a large army on the march (or row, in this case), you need to have scouts sweeping your flanks to make sure you’re not marching into an ambush. Ask General Braddock about that one. Two of the junior members of the scouts are up to something. See them plot when you vote for Snow by Night on Top Web Comics. Related: be wary of any man who keeps a pig farm. Except for that one part, where, you know, everything. Hey, I have an idea! Let’s send Snow out to be all magical, scary & “WHO DARES ENTER MY PRESENCE”. That’ll scare them off…right? Actually, whacking a few scouts might not be the worst idea, if they want to help Sherbourg. A missing scouting party might very well warn the attackers off. It makes them suspicious that their cover’s been blown and the enemy is alerted to their presence. nah. that’s when police or the military call in for reinforcements. last thing we need to do is let them know we know they’re coming, and we are capable of whacking a few off. i like the bear idea – throw them in with some bears!